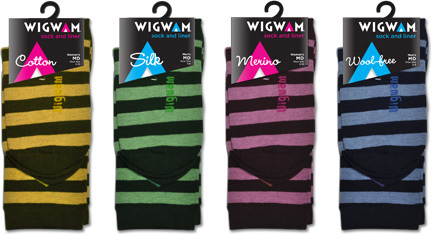 MSLK has developed and designed a new casual line for performance sock manufacturer, Wigwam Mills. If you’re a reader of this blog or loyal Wigwam consumer, you might already be somewhat familiar with their extensive product offering. What you may not know, is that in addition to their athletic socks, they make a variety of stylish everyday socks. These products were getting lost in the clutter as they were being marketed in the outdoor category, causing confusion for retailers and consumers. In order to combat the issue and reinvigorate the sales for these products, we led Wigwam towards the decision to create a new line, Wigwam Casual. With over 300 styles for all occasions, performance sock manufacturer Wigwam Mills has the most extensive product line of any sock company. As part of our 2012 packaging redesign, a reevaluation of their overall brand hierarchy was needed. Besides their popular hiking and running socks, Wigwam makes a number of fashionable, style-driven socks, which were being marketed in the outdoor category. Sales were stagnant as these socks got lost among their high-performance athletic counterparts. MSLK led a series of collaborative exercises to establish the most effective brand hierarchy. We determined that Wigwam’s fashionable socks did not belong with their performance ones, leading us to develop a separate line, Wigwam Casual. While the performance sock packaging focused on activity, the primary fiber: cotton, silk, merino, and wool-free would be the focus of the casual packaging. We moved the former sock names to an imprintable area on the back, thereby providing Wigwam with a cost effective solution that drastically reduced the number of different packages that would need to be printed. In order to appeal to a mostly female audience, the new casual design would have to be softer and more elegant than the performance packaging. Drawing upon the graphic treatments we established for the 2012 rebranding, we used the teepee as the primary branding element, yet made it smaller and filled with bright magenta for women and cyan for men. The fiber is written in a casual script that dynamically breaks through the teepee. 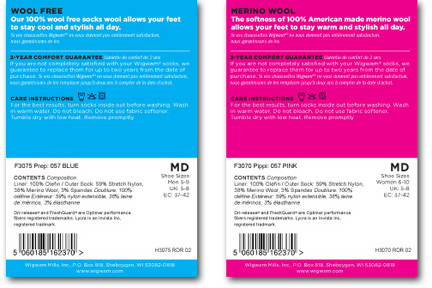 In addition, we decided to make the package face smaller in order to showcase more of the sock’s design. The new casual packaging received unprecedented buzz at a recent international sales meeting and continues to be a hit with major retailers at tradeshows. Wigwam has eagerly adopted the new branding and has incorporated it into all related promotional efforts. 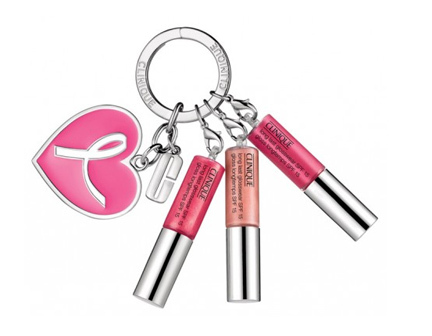 The packaging will debut later this summer.